Vaccination days at the health center in Bante are often delayed by women who are tardy. This may be due to a lack of a comfortable waiting space. 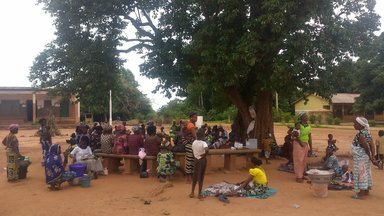 In Benin, vaccination days are generally held in the local health center’s gazebo which Bante does not have. The women must wait with their infants in the harsh midday sun until vaccines start, which can take hours from when they first arrive. If there is strong rain or winds, vaccinations are stopped to move everything inside the clinic. When more women show up then benches are available, most women choose to simply sit on the ground. The presence of a gazebo would not only make vaccinations days run more smoothly, but would also provide a safer place for women and small children to wait. In addition, the gazebo would create a platform for local women to be trained and to give presentations on important health topics such as childhood nutrition, breastfeeding, and pre-natal care. These women would be supported by the community, and would be trained by community health workers who have received prior training on these topics and are knowledgeable of the community and its needs. A community vaccination center would also create a meeting place for many local and national NGOs. Currently, they have to meet outside of Bante, requiring community members and health agents to frequently travel out of site. This often leaves the health center understaffed for days at a time. The health center employees and the local mothers have expressed a desire for a vaccination gazebo to help vaccination days run more smoothly and to be more comfortable for the women and their children. The health center employees have also expressed a desire to use the time the mothers spend waiting for vaccines more productively, but do not have the time or resources to give health talks every week. I have spoken with local women who want to work with me who are interested in nutrition and implementing a women-driven nutrition education program during vaccination days. My counterparts and community health workers have agreed to help me find participants and to set up and run the program and training with my help. The head of the health center and my counterpart have both expressed interest in helping ensure that the program is long lasting and will continue after my departure. The health center and its employees have volunteered free labor and various supplies to construct the gazebo itself. The employees of the health center are committed to making sure the gazebo is properly used and to ensure that is maintained and kept clean in the same manner that they already maintain the rest of the health center. The employees and my counterpart will have the knowledge to continue the training with new women to continue the program, and only strongly motivated women will participate that have proven that they will encourage and promote healthy behaviors to their peers. Enough people will be involved to create a system of accountability. For the training program itself, my role will only be to help make the training guide so that I can ensure certain topics are covered, but all of the actual training will be performed by host country nationals to ensure that they can the capability to replicate the sessions in the future.